Using self-modified version of “Carnival Dance” pattern to use 5″ charm packs. Adding in extra borders to help increase size. Used Red Pepper Quilts hour glass block tutorial. Had some issues with stretching on the bias. Needed to pay more attention to making sure seams would match up when sewing them into four hour glass units. 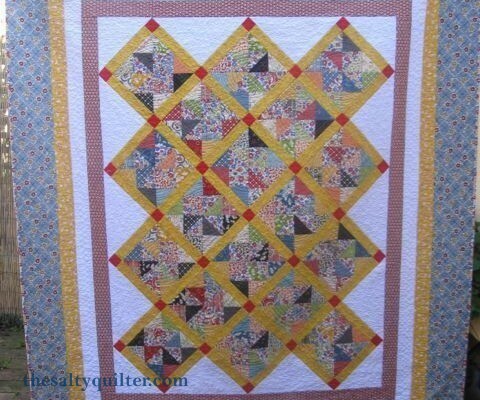 Used formula for side triangles from Quilter’s Academy Vol 2. 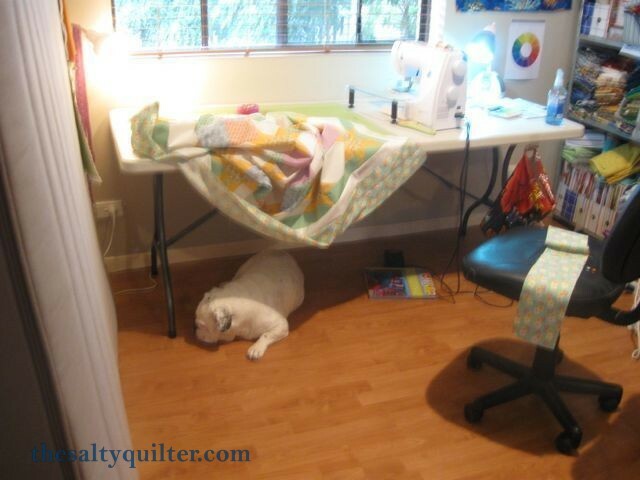 Tried to follow their method for trimming the quilt, but was not very successful. Next time need to measure out from centre. Made matching pillowcase with left over fabric. 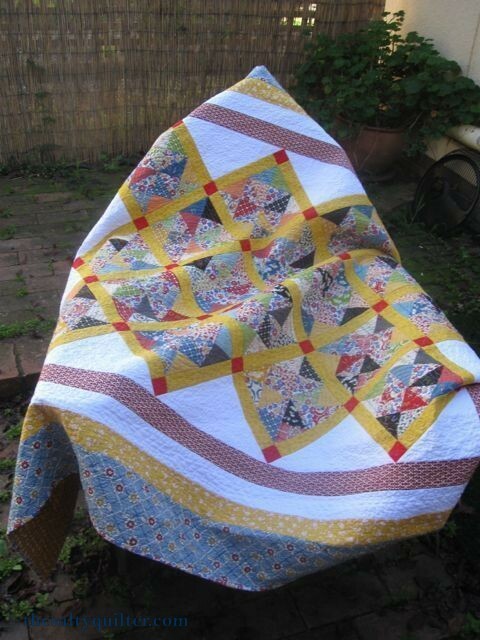 Used “The Quilter” pattern, but modified to use a French seam on the inside. Needed to take a deeper second seem to avoid the first coming through. Needed to hammer the cuff joint to make it more flexible to sew through. Center ditch quilted with Rasant cotton wrapped poly thread. Quilted a large spiral in the pinwheel blocks with King Tut 40wt variegated thread (Cleopatra). 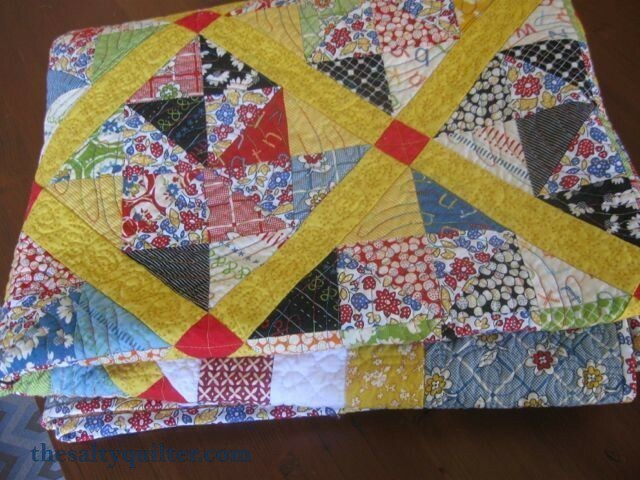 Quilted running spirals in yellow sashing with free motion X through red cornerstones. 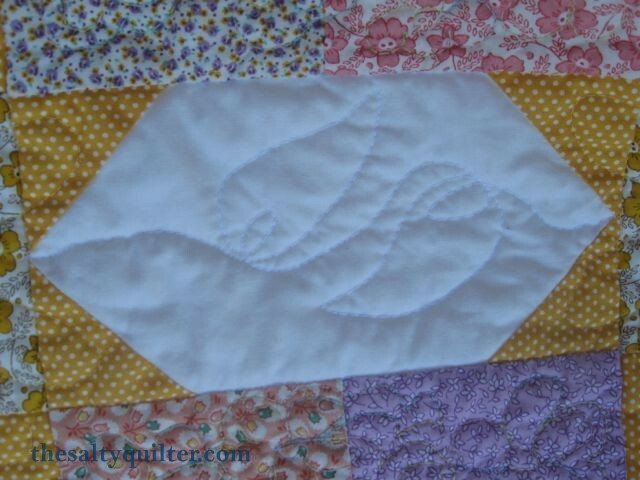 Quilted curls in white setting triangles, piano keys in red border, double loop in white border, “l” loops in yellow border (with the name “hazel” in cursive in one corner), and open spirals in blue border. 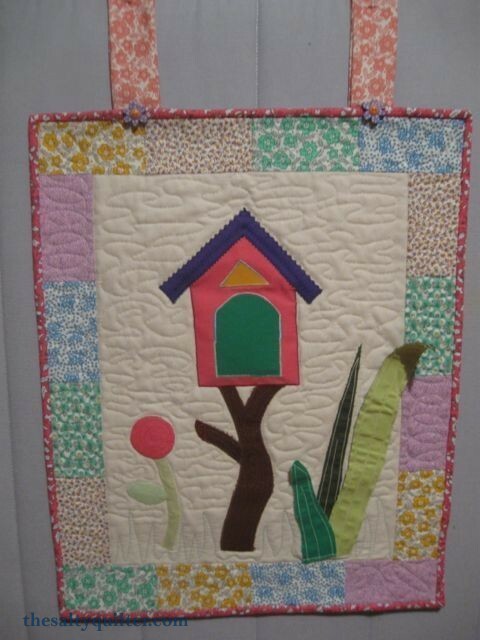 Started in Susan’s machine applique class at Sewco. 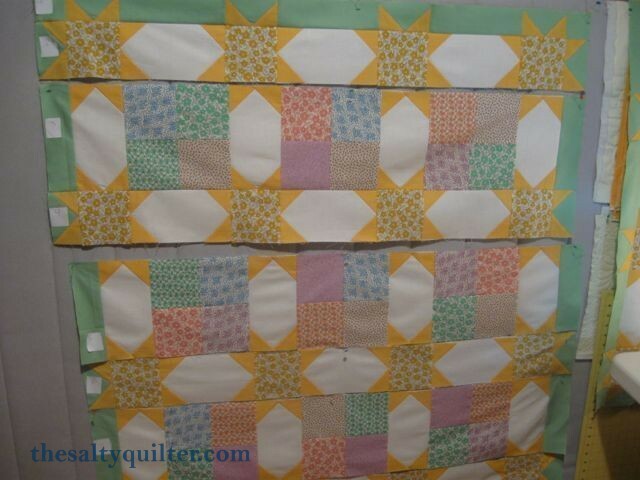 Added border from left over fabrics from Sunny Stars. Quilted with Gutterman 100% 50wt cotton for free motion and stitch in the ditch. Entered in 2011 Goomeri Pumpkin Festival patchwork show. 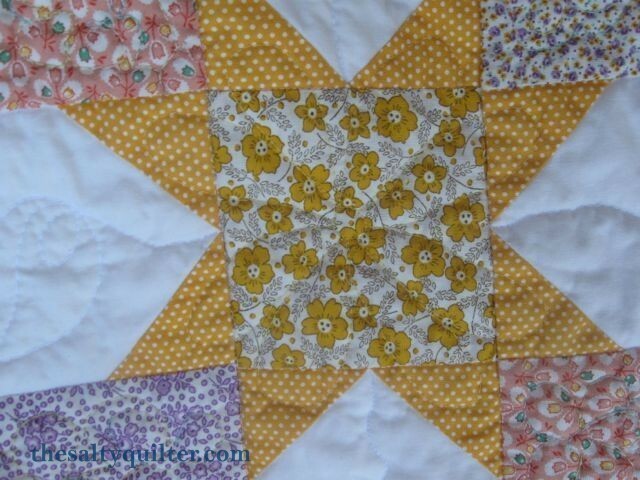 Used left over fabric from “Sunny Stars” quilt plus oranges from stash and Sewco. Added double fused leaf and small yo-you butterfly. 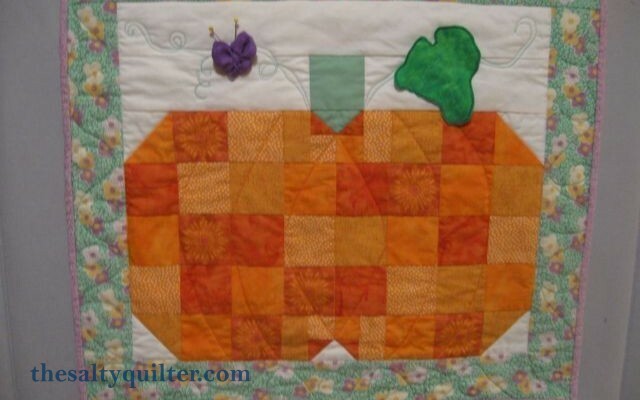 Used walking foot to quilt around borders and pumpkin, plus the curves inside the pumpkin. 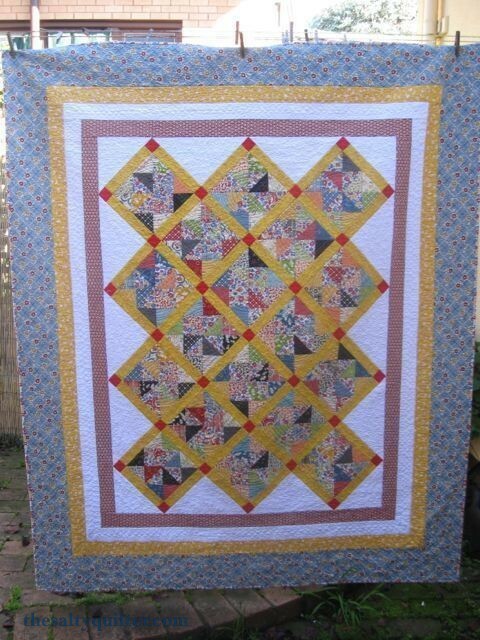 FMQ’ed pumpkin vines and border. Thread – Gutterman Cotton 50wt. 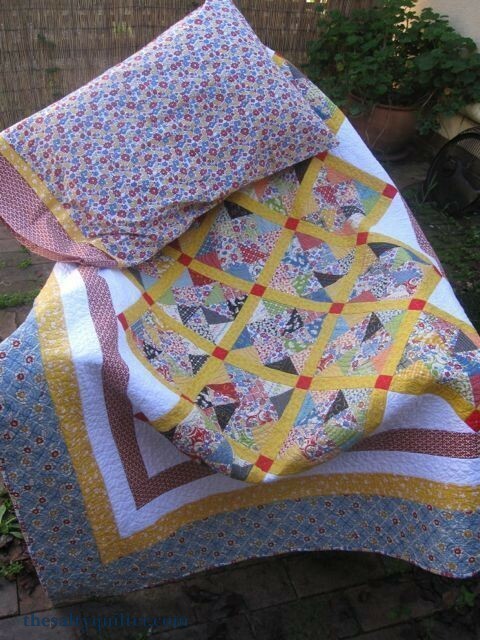 Used a kit from the Fat Quarter Shop with “Everything But the Kitchen Sink” 1930’s reproduction fabric. The kit had tons of fabric, probably 30% more than I actually needed, so I got lots of scraps. 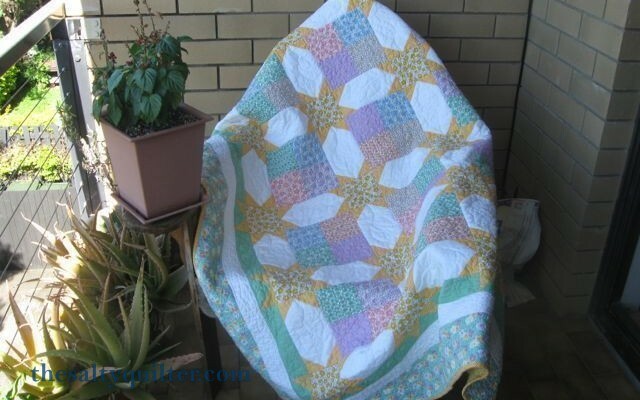 Quilted flowers in the four patch blocks with Mettler 12wt variegated thread “Easter Egg” with 90 topstitch needle. Thread left a lot of lint in machine. 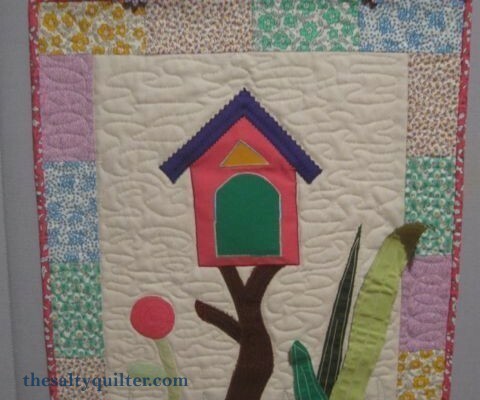 Quilted leaves in white sashsing, large flower in yellow cornerstones going into yellow diagonal corners on sashing, vines on solid green border, looped “l’s” on white border and flowers in green print border all with Gutterman 100% cotton 50wt thread. 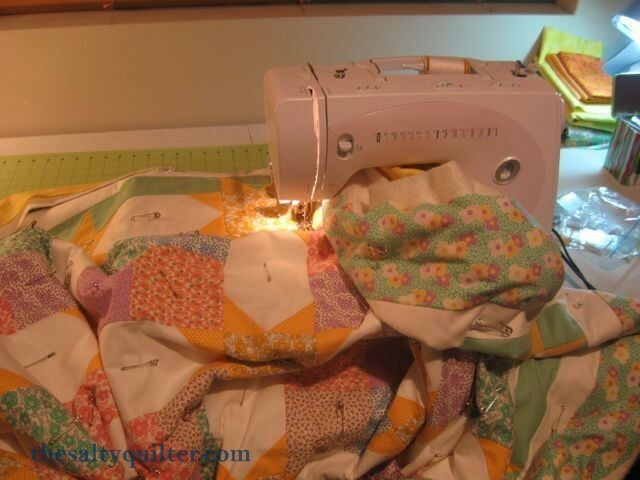 The moment I figured out the maximum size I could quilt with my Bernette. Sarah the Bulldog being very helpful.